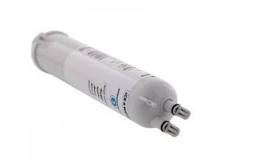 This replacement water filter EDR3RXD1 is for many model Whirlpool, Kenmore, Maytag, Amana and many more brand refrigerators. Model TIWB2L: Style 1 – When the filter indicator reads 10%, order a new filter. When the filter indicator reads 0%, it is recommended that you replace the filter. Style 2 – When the filter indicator light changes from green to yellow, order a new filter. When the filter indicator light changes from yellow to red, it is recommended that you replace the filter. Model T1WB2: Change the water filter cartridge every 6 months depending upon your usage. If the water flow to the water dispenser or ice maker decreases noticeably before 6 months have passed, replace the water filter cartridge more often. 1. Press the eject button to release the filter from the base grille. 2. Pull the filter straight out. 3. Turn the cap counterclockwise to remove it from the filter. IMPORTANT: Do not discard the cap. It is part of your refrigerator. Keep the cap to use with the replacement filter. 4. Align the ridge on the cap with the arrow on the new filter and turn the cap until it snaps into place. NOTE: You can run the dispenser without a filter. Your water will not be filtered. Simply insert the cap all of the way into the base grille and rotate the cap until it is firmly in place. 5. Remove the protective covers from the O-rings. 6. Push the filter into the base grille. The eject button will pop back out when the filter is fully engaged. 7. Flush the water system. Flush the water system by dispensing water into a sturdy container until you draw and discard 2 to 3 gal. (8 to 12 L) of water, or for approximately 5 minutes after the water begins dispensing. The flushing process cleans the water system and clears air from the lines. As the air is cleared from the lines, water may spurt out of the dispenser. If you need any other type of water filter or instructions for replacing it just ask one of our techs in live chat for free. This guide is for all the models listed below in the tags section and many others.